Nasser Bakhshi is a self taught artist and lives far from the hustle and bustle of the Capital of Tehran, in the wonderful land of Azerbaijan. 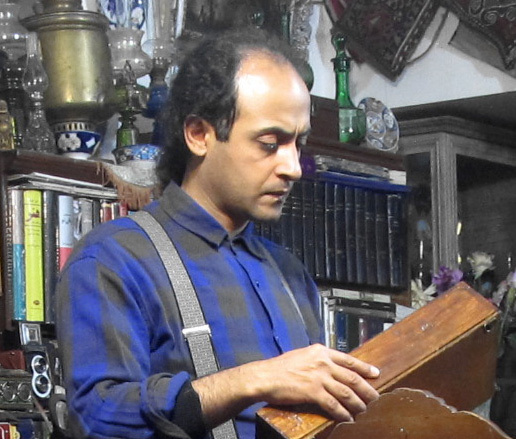 He places his memories and bits of his soul and heart as well as our collective memories inside old boxes that he finds in forgotten corners of the city of Tabriz. His large paintings are “details” of the paintings within the boxes; taken out of their place and accentuated, a reverse action of seeing with magnifying glass . The boxes are accumulation of images and elements that Mr. Bakhshi lives with and they narrate the dreams and wishes, as well as failures and uncertainties of their creator; who is one of many, one of us, many of us.